Cue the gift return lines, repack the Amazon boxes, and make sure you try on those pants one more time in order to confirm they are too tight. The days after Christmas finds us wandering the house in new plaid pajama pants and someone else’s Harry Potter slippers. We begin this sacred day after the holiday by binge eating leftovers which, in reality, have no business spending time on a plate together. Pecan pie with leftover Chinese cuisine? Do it. Turkey sandwich covered with the remaining grilled asparagus? Bam. Two pieces of fudge, one of which is peanut butter, cold prime rib, and glazed carrots? It’s breakfast. For the next few days we are allowed to eat things in the order they are removed from the Frigidaire. State law! The only thing we ask is for you to try to keep the gravy stains off your new Marginally Famous Bangor Police Department Facebook page Duck of Justice hoodie. Mrs. Schramke has advised me that her husband, Jan, just cannot bring himself to take this sportswear off. 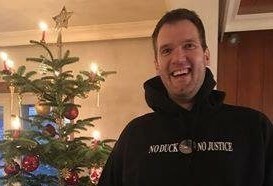 Jan Schramke is in Germany and wanted to break-in his hoodie before hitting the streets and spending the rest of his week explaining what the heck a “Duck of Justice” is to his German brethren. Jan has never looked happier to me. Of course, I have never seen Jan in his maroon velour sweatsedo and Air Jordans, but that has now been replaced as the leisure clothing of choice. We would like to thank Marie for sending us the photo. BPD Duck of Justice is occasionally posted in BDN Maine Weekly on Thursdays. This installment is for Jan. 3.